It is only in recent years that the mysterious painter called "Monsù Desiderio" has been separated into two artists who collaborated: Didier Barra and Franois de Nom (1593-1644), both from Metz, Lorraine. 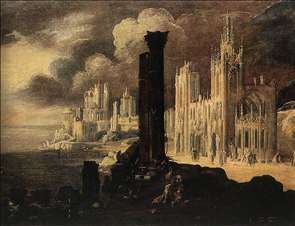 Didier Barra usually painted topographical views, chiefly of Naples. Franois de Nom was the more adventurous of the two, concentrating on the bizarre. Both painters spent their entire careers in Naples but never assimilated any local influences; they both retained a form of archaising mannerism of a similar type to that of Claude Deruet. At their best, Franois de Nom s pictures excite by their power of expression, even though they seem flagrantly to disobey almost every rule of art. 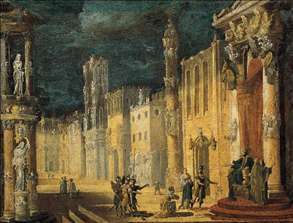 See more details about "Landscape with Buildings"
See more details about "The Judgment of Salomon"